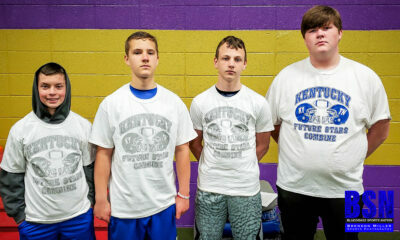 LEXINGTON, Ky. – The Wildcats are headed back to Nashville. 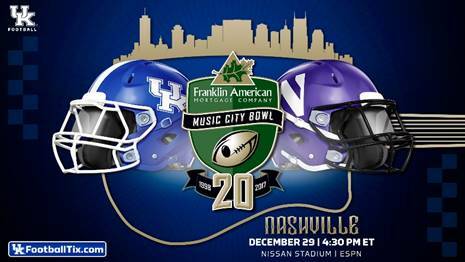 Kentucky has accepted a bid to play in the Franklin American Mortgage Music City Bowl and will take on Northwestern. The game will be played at 4:30 p.m. ET on Friday, Dec. 29 at Nissan Stadium in Nashville and will be broadcast on ESPN. The Music City Bowl has been played continuously since its founding in 1998, sharing an affiliation with the Southeastern Conference ever since. This year marks the 20th anniversary of the Music City Bowl. The bowl appearance is the second in a row for the Wildcats after they reached the TaxSlayer Bowl a season ago. It is Kentucky’s 17th bowl appearance all time and the Wildcats own a record of 8-8 in those games. This will mark UK’s fifth appearance in the Music City Bowl, the most of any team in the history of the bowl. UK has a 2-2 record in the bowl, scoring memorable wins over Clemson and Florida State in 2006 and 2007. Kentucky has a history of bringing big crowds to Nashville for the game, with the 2006 (68,024) and 2007 (68,661) editions being the best-attended games in Music City Bowl history. The UK Ticket Office is now accepting ticket requests for the Music City Bowl from both season ticket holders and the general public. Fans should visit UKFootballTix.com for full information and to request tickets. Fans are highly encouraged to request tickets through UK Athletics, as institutional ticket purchases can impact future bowl opportunities. The priority ordering period runs through Monday, Dec. 4 at 4 p.m. Tickets requested during the priority ordering period will be allocated by K Fund priority point ranking with priority given to 2017 football season ticket holders and those who placed a 2018 season ticket deposit. Ticket requests will be filled based on availability. Kentucky will enter the Music City Bowl with a record of 7-5. 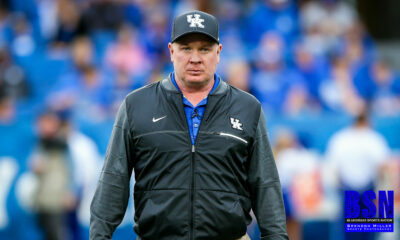 UK is one of two teams the country to tie or improve its win total from the previous year in each of the last five seasons, which coincides with Stoops’ tenure in Lexington. The Wildcats also went 4-4 in SEC, giving them a .500 record in conference play in back-to-back seasons for the first time since 1998-99. UK has had success away from home this season, claiming road victories over Southern Miss, South Carolina and Vanderbilt. UK is led on offense by sophomore running back Benny Snell Jr., who ended the regular season leading the SEC in rushing yards with 1,318. His 18 touchdowns in 2017 set school records for both total touchdowns and rushing touchdowns in a single season. Standout junior linebackers Denzil Ware and Josh Allen – both ranking in the top 10 in the SEC in sacks – and junior safety Mike Edwards – tied for second in the SEC in interceptions – headline UK’s defense. Northwestern carries a record of 9-3 (7-2 Big Ten) into the Music City Bowl. The Wildcats closed the season as one of the hottest teams in the country, winning seven straight games to finish No. 21 in the final College Football Playoff rankings. Northwestern has reached bowl games in three straight seasons and eight of the last 10 under head coach Pat Fitzgerald. All Big Ten performer Justin Jackson rushed for 1,154 yards to lead the Wildcat offense and the Northwestern defense is allowing just 19.8 points per game.